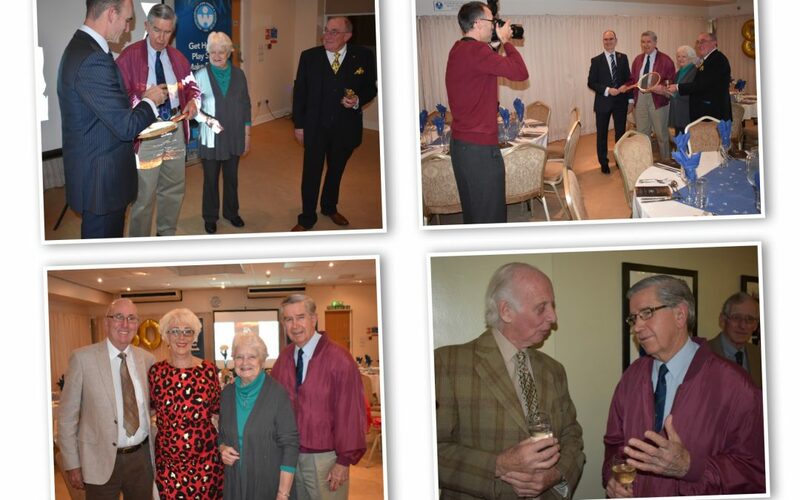 A memorable and nostalgic night was had by all as Wolverhampton Lawn Tennis & Squash Club marked the 80thanniversary of the return to the current site with a celebratory dinner on Saturday night. The club were delighted to welcome three special guests to the club to mark the anniversary celebration, five-times Grand Slam doubles champion Frew McMillan, another former top player in Ted Beards, and former UK squash number one Anna Bullock (nee Craven Smith). Club President Ron Stevenson was Master of Ceremonies for the night, Rod Willetts delivered a presentation about his ongoing work to compile a history of the club (Click here for more details), and Frew himself spoke about his illustrious career to the 80 assembled guests. “Frew delivered some tremendous stories about his tennis partners and rivals, and revealed a connection to Wolverhampton which was most surprising,” said Rod. “He was actually awarded a Doctrine of the City (by the University of Wolverhampton) ten years ago. “He also did a Question & Answer session for guests which was extremely interesting, including the question of why he was one of the first two-handed players. “’Because I used my mother’s full-size racket which was a bit heavy for a five-year-old’ was the response. Frew, who won the top tournament at WLTSC in 1962. 1963 and 1970, was delighted to catch up again with former friendly foe Ted, who also made it to Wimbledon in his playing days. Frew, who attended the evening with wife Sally, has since contacted Ron to pass on his appreciation. “We greatly enjoyed ourselves,” he said. “It was a treat for me to revisit the scene of my playing days and I could not quite comprehend the huge expansion of the Club. Most impressive! At the end of the night Frew and Sally were presented with gifts to mark the occasion by WLTSC chairman John Hollingsworth. *Photos from the evening, taken by an Express & Star photographer, will appear in a future edition of the Wolverhampton Magazine.